Kevin White (Wincott) is a DEA agent who travels from Washington DC to California, hot on the trail of evil Russians that are ex-KGB agents who are now drug runners. While there, he ends up teaming up with his brother Jack White (Hudson, not the ghoul-like guitar player/singer from the White Stripes). 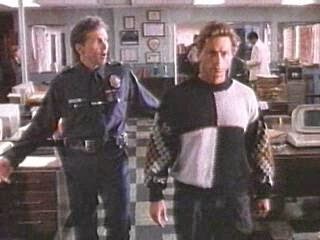 Thankfully for us, both brothers are “karate cops” who can put baddies in their place with their feet and fists. Jack is more of a bull in a china shop (almost literally, going by his introduction in the film). Unfortunately, Jack is also dirty, and he’s double dealing - helping the baddies and his brother. All this causes their father, known only to us as Mr. White (Jaeckel) to crawl into a bottle of generic whisky. Will these blood brothers spill blood while proving that blood is thicker than water? Find out today! 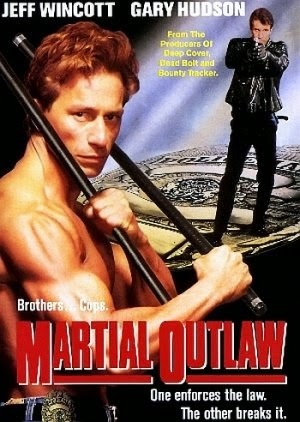 Martial Outlaw (you gotta love that title) makes a great companion piece with Mission of Justice (1992). Both are done by the same people, they have a similar look and feel, and both, of course, star Jeff Wincott. They even have a similar strategy for their placement of fight scenes - in Mission, the big blowout fight was in the garage, and here it’s in the restaurant. They both have a scene in a gym where Wincott beats up a lot of people. We would certainly recommend the two for a double bill of VHS action brilliance. Outlaw reinforces our love for Wincott - he has a power-packed fighting style which is infectious for the audience, and he can do it while wearing a turtleneck and sportcoat. It’s all complemented by his cool 90’s hair, and his stylish sweaters he wears to the gun range are the icing on the cake. His line of casual gun-range wear would singe the retinas of Bill Cosby. But what else would you expect one to wear when in a state of deep concentration? But he’s also likable, which is more important than a thousand sweaters (which are the exact words we’re all taught in school). Funnily enough, Wincott, or should we say Kevin White, can always find a way to have two Arnis fighting sticks in any situation, no matter how dangerous. Two legs will break off a chair and fall into his hands, or bigger sticks will break in two. You can almost set your watch by the regularity with which Kevin White pummels opponents with two hand-held sticks. Physically, Gary Hudson and Wincott are perfectly cast as brothers, and their psychological tension as siblings is believable and even compelling. And Richard Jaeckel was a nice choice as dad. The baddie even has a goon which closely resembles Martin Kove. Adding further interest are the fax machines, pagers, and classic computers which are all hallmarks of a certain place and time we just can’t seem to get enough of seeing on screen. Martial Outlaw delivers what fans of 90’s DTV action want, and it is indeed a satisfying experience. We recommend it. Nice review. Wincott is severely underrated as an action star. Thanks! Can't agree more. Wincott made some solid action films. Yup, this one is awesome. This was one of Wincott's best. He should have continued making this type of movies. The restaurant fight is a classic. Explosive Action and Roger: Can't agree more. Wincott delivered the goods in this one. Lots of fun fights that still hold up. Nice review, you're right about those sticks! This was top notch action, Wincott delivers and the rest of the cast complements a well made movie. loved the brothers v goons fight in the middle and how many guns did he take to the range? ! Can't agree more. Jeff Wincott with the sticks is action movie gold. Thanks for your comment.